»Talking Popcorn« is a sound sculpture that evolved out of Nina Katchadourian’s interest in language, translation, and Morse Code. 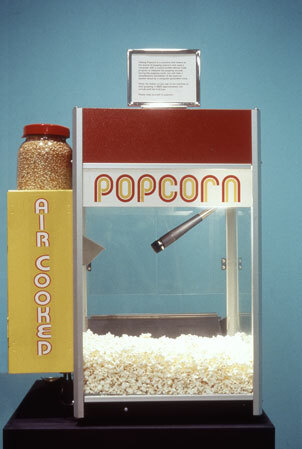 A microphone in the cabinet of the popcorn machine picks up sound of popping corn, and a computer hidden in the pedestal runs a custom written program that translates the popping sounds according to the patterns and dictates of Morse Code. A computer generated voice provides a simultaneous spoken translation.